Stellar lumen price climbed higher sharply after it broke the $0.1150 resistance against the US Dollar. XLM price tested the $0.1350 resistance level and it is currently correcting lower. There is a crucial bullish trend line in place with support at $0.1220 on the 4-hours chart (data feed via Kraken). The pair is likely to climb higher further towards the $0.1450 and $0.1500 resistance levels. Stellar lumen price regained its bullish bias this past week against the US Dollar, bitcoin and Ethereum. XLM price remains supported on dips and soon it could trade towards $0.1500. This past week, stellar lumen price formed a solid support above $0.1000 and climbed higher against the US Dollar. The XLM/USD pair broke the key $0.1120 and $0.1150 resistance levels to start a strong upward move. It rallied by more than 15% and traded above the $0.1200 and $0.1250 resistance levels. There was even a close above the $0.1250 level and the 55 simple moving average (4-hours). The price tested the $0.1350 resistance and later corrected lower. It tested the $0.1150 support area (the previous resistance) and bounced back. The price retested the $0.1350 resistance area and a new yearly high was formed recently near $0.1362. At the moment, the price is correcting lower below the $0.1320 level and the 23.6% Fibonacci retracement level of the last wave from the $0.1136 low to $0.1362 high. However, there are many supports near the $0.1280 and $0.1250 levels. The 50% Fibonacci retracement level of the last wave from the $0.1136 low to $0.1362 high is also near the $0.1250 level. Moreover, there is a crucial bullish trend line in place with support at $0.1220 on the 4-hours chart. Therefore, if the price corrects lower, it could find a strong buying interest near the $0.1250 level. On the upside, an initial resistance is near the $0.1320 level. The main resistance is at $0.1350. A successful daily close above $0.1350 is likely to set the tone for more gains towards the $0.1450 and $0.1500 levels. 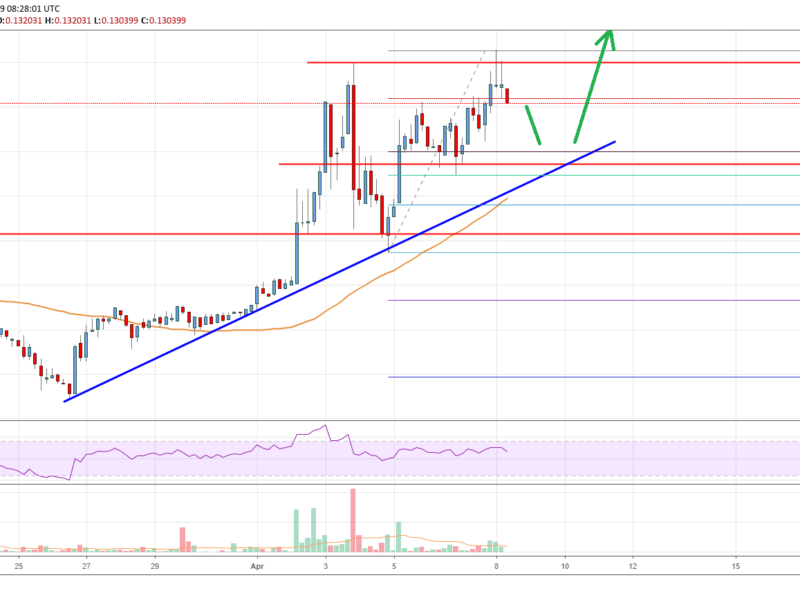 The chart indicates that XLM price is trading nicely in an uptrend above the $0.1220 and $0.1250 support levels. If there are further downsides below $0.1220, the price may perhaps revisit the $0.1150 support area. On the upside, a clear break above the $0.1350 resistance is likely to push the price towards the $0.1450 and $0.1500 resistances in the near term. 4 hours MACD – The MACD for XLM/USD is slowly reducing its bullish slope. 4 hours RSI – The RSI for XLM/USD is currently correcting lower towards the 50 level. Key Support Levels – $0.1250 and $0.1220. Key Resistance Levels – $0.1320, $0.1350 and $0.1450.